June 25, 2018 at 10:43 pm. Here are some guys notable for missing all or most of last season due to injury … or who have otherwise just been missing. 10. Jake Luton, QB, Oregon State: He was the Beavers’ starter last season when he suffered a thoracic spine fracture. We’re not WebMD, but we don’t love the way that sounds, so it was great to see him back at spring practice. That’s when the 6-7 senior looked like a snug fit for new coach Jonathan Smith’s pro-style approach. 9. Jon Baker, C, Boston College: A knee injury in the 2017 opener wiped out his season. Now, he’s back to anchor the line and … wait … Boston College is running tempo? Eagles, we don’t even know you anymore. 8. Connor Strachan, LB, Boston College: If there is one thing we like more than a Boston College offensive lineman, it’s a Boston College linebacker. This dude had seven fumble recoveries in two seasons before playing in only two games last season because of a knee injury. 7. Britain Covey, WR, Utah: Freshman All-American in 2015 returned from a two-year church mission to find the Utes had gone spread, too, with coordinator Troy Taylor. 6. Cody Thompson, WR, Toledo: A season-ending leg injury last season was a good thing, if by good you mean he gets to come back for a fifth year and help form one of the most prolific receiving trios in college football with Diontae Johnson and Jon’Vea Johnson. Consider that he had 1,269 receiving yards and 11 TDs in 2016. 5. Peyton Pelluer, LB, Washington State: A two-time leading tackler for the Cougs, Pelluer comes back for a sixth season after suffering a foot injury early last season. 4. Jordan Scarlett, RB, Florida: Coming back from a season-long suspension, he reclaimed a starting role in the spring for new coach Dan Mullen. 3. Caleb Wilson, TE, UCLA: He played in only five games last season. Thing is, it only took him five games to catch 38 passes for 490 yards. 2. Jalen Hurd, WR, Baylor: A minute ago, he was a talented running back leaving Butch Jones’ Tennessee team in the middle of the 2016 season. Go figure. 1. 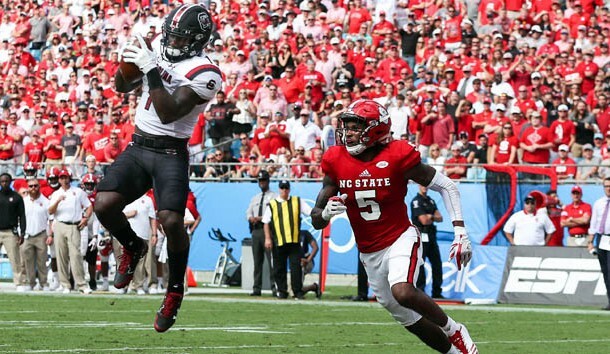 Deebo Samuel, WR, South Carolina: Watch him return (kicks, that is).